Infant and child car seats save lives. For every ride in a car, secure your child into a properly installed car seat or booster seat that meets all current safety standards. Use a car seat or booster seat that is made for their weight and height. For questions about car seats and booster seats, call Transport Canada at 1-800-333-0371 or visit the Government of Canada Child Safety webpage at www.canada.ca/en/services/transport/road/child-car-seat-safety.html. A child who is not in a car seat can be seriously injured or killed during a crash or an abrupt stop, even at low speeds. A parent's arms are not strong enough to hold and protect a baby during a car crash. Many unrestrained children die because they are torn from an adult's arms during a crash. Set a good example for your children by always wearing your own seat belt, and always insist that they buckle up. Use a rear-facing car seat that reclines and faces the rear for your baby. It is safest for your baby to remain in a rear-facing infant seat until he or she reaches the maximum weight or height allowed by the car seat's manufacturer. See a picture of a rear-facing car seat. When your child outgrows a rear-facing infant seat, look for another rear-facing car seat. Use a forward-facing seat that faces the front and has a harness. Use a forward-facing seat when your child outgrows the maximum weight or height allowed by the manufacturer of the rear-facing infant seat. Keep using a forward-facing seat until your child no longer fits in it. Some infant seats can be converted into forward-facing seats. See a picture of a forward-facing car seat. Use a booster seat with a regular lap and shoulder belt for children who have outgrown their forward-facing car seats. Booster seats raise the child up so that the lap and shoulder seat belts fit properly. Adjust the shoulder belt to fit across the shoulder, not the neck. Adjust the lap belt to fit across the hips, not the stomach. Use this type of seat until adult seat belts fit your child correctly. See a picture of a booster seat. Don't buy a used car seat. If a car seat has been recalled or has been in a car crash or misused, it may not fully protect your baby. 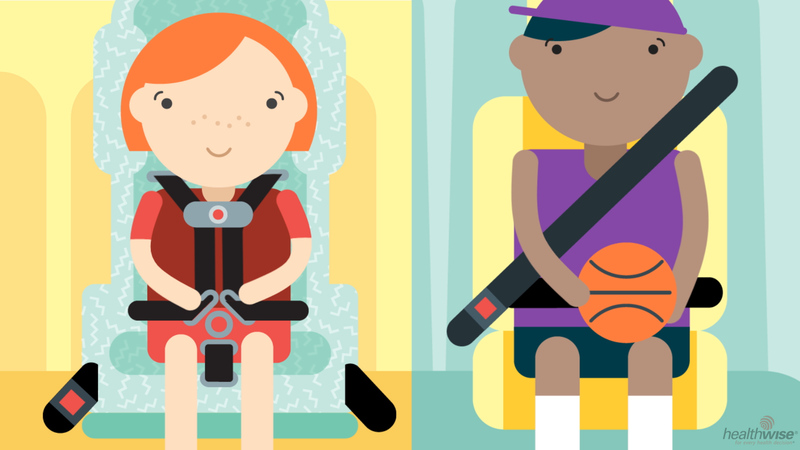 Check your provincial laws for when your child can move to a seat belt. For maximum safety, follow the manufacturer's recommendations for car seat use, which should include weight guidelines, installation procedures, and how to position and secure your child. The safest position for your baby or child is in the back, middle seat of the car. Do not place your child's car seat in the front seat of any vehicle with a passenger side air bag that cannot be turned off. Use the Universal Anchorage System (UAS) if you have it in your car. This feature allows parents to secure the car seat onto a permanently installed hook. Check your car owner's manual for more information. Do not allow a child younger than age 13 to sit in the front seat of any vehicle. Make sure a rear-facing seat is at an angle where your infant's head does not flop forward. It is okay for your baby to fall asleep while travelling as long as the straps are in the right position. Do not put your baby down to sleep in a car seat. It should only be used for travel. Take extra care if you have a premature infant. Slouching may affect his or her breathing and oxygen supply. Do not let your child get out of his or her seat while the car is moving. If your child needs attention, stop the car, take the child out of the seat, take care of his or her needs, and put him or her back into the seat before the car starts moving again. If your child is fussy again soon after, stop and check your child again. Committee on Injury, Violence, and Poison Prevention (2011, reaffirmed 2014). Policy Statement: Child passenger safety. Pediatrics, 127: 788. DOI: 10.1542/peds.2011-0213. Accessed February 12, 2015.